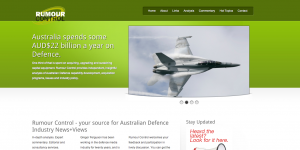 Rumour Control's new site replaces an HTML site Arion had built for Gregor Ferguson's company three years ago. The new CMS site incorporates a blog and gives Gregor the ability to make his own additions and edits. It brings together Rumour Control's brochureware/articles site with the blog and negates the need for a separate blog hosted on Blogger.